Over the last decade, the UK has seen dramatic increases in the number of people prescribed psychiatric drugs. 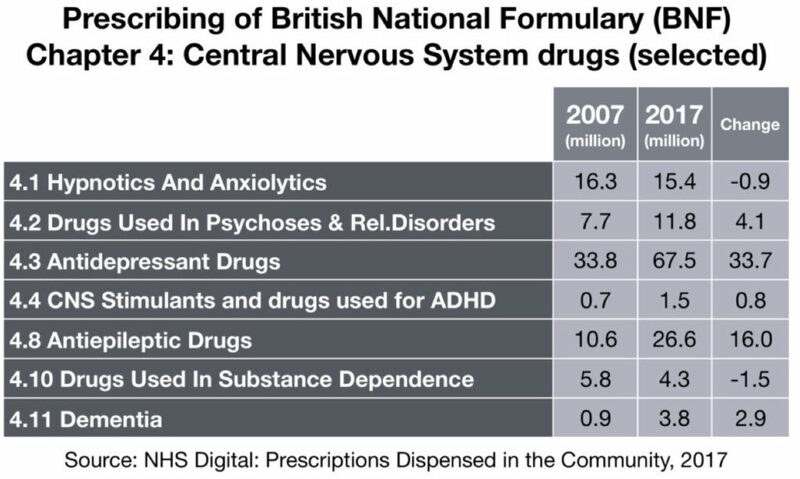 In the British National Formulary, Chapter 4 represents Central Nervous System drugs including antidepressants, antipsychotics, anxiolytics, antiepileptics and sedatives. The total numbers prescribed have increased by 50% across the whole chapter from 138 million in 2007 to 208 million items in 2017. Both the Scottish and Welsh Parliaments have been debating the issues surrounding the overuse of psychiatric drugs. They have been encouraged into action by petitions launched by those with lived experience and therapists who have witnessed first-hand the terrible difficulty that some people can have coming off psychiatric drugs.